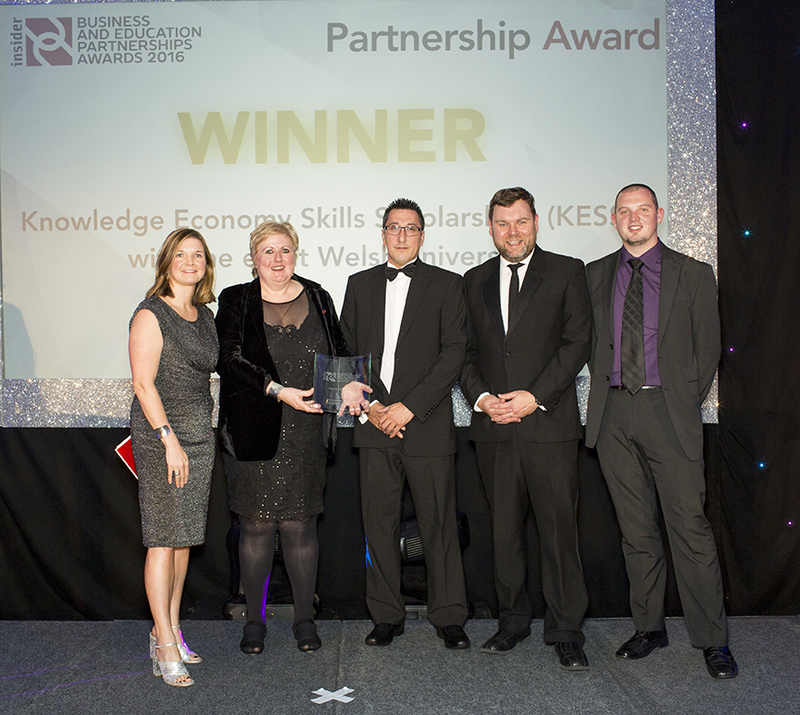 KESS 2 achieved a ‘double’ at the recent Business Insider Business and Education Partnerships Awards 2016. KESS 2, which is led by Bangor University on behalf of the higher education sector in Wales, was awarded the Partnership Award and the Award for New Process was won by Dr Steffan Thomas of Bangor University and Sain Recordiau Cyf/Sain Records Ltd. 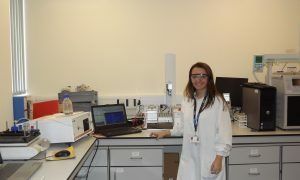 This was also a project fulfilled through the previous KESS scheme and a Knowledge Transfer Partnership (KTP). Dr Penny Dowdney, Brian Murcutt, Bryn Jones and Dr Steffan Thomas receiving the Partnership Award for KESS 2 at the Business and Education Partnerships Awards 2016. 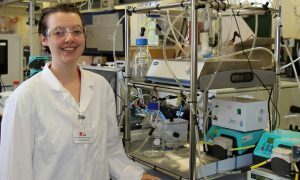 Knowledge Economy Skills Scholarships (KESS 2) is a £36m EU-backed scheme to develop post-graduate research and innovation skills in partnership with small and medium-sized businesses. 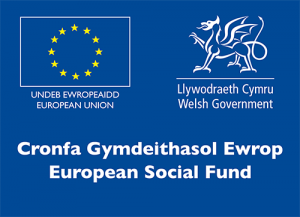 It is a major pan-Wales operation involving all eight Universities in Wales and is supported by the European Social Fund (ESF) through the Welsh Government. 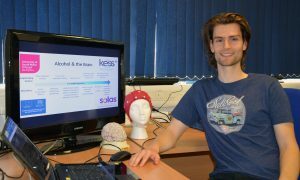 Following the highly successful KESS project between 2009 and 2014, KESS 2 is now in the second round of funding and will provide 645 scholarships over the course of six years. Dr Steffan Thomas’s project provides an excellent example of the scheme’s successful format. As part of the KESS project, Dr Thomas conducted extensive research into various aspects of Sain Records Ltd, including e-marketing, consumer behaviour, copyright law, piracy, emerging business models as well as reviewing other media industries’ practices. After collecting and analysing the survey responses of 1,500 people, a new business model was developed, that suited a production company working within a minority language. The main outcome of this collaborative work between Bangor University and Sain Records Ltd was the development of a new website and a new digital distribution store. These developments resulted in the company seeing a 70% rise in digital sales in the first 12 months and a further 15% increase year on year thereafter. KESS 2 links businesses with academic expertise in the Higher Education sector in Wales to undertake collaborative research projects; KESS 2 builds on the expertise established during the first phase of KESS, and aims to deepen existing relationships with company partners as well as building new partnerships. KESS 2 Scholarships develop higher-level skills, an aspect of the project that benefits all participants. There are currently 83 live KESS 2 projects and 137 approved to start, all with strong business-academic links and with innovative research in the pipeline. 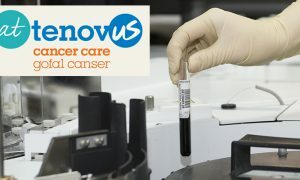 Current doctoral level research includes projects with company partners such as: ConvaTec Ltd to develop an ‘Anti-inflammatory dressing for diabetic ulcers; Cwmni Da to evaluate the success of the company’s Welsh language and bilingual aps and digital Material’; Jellagen; Cultech Ltd; Siemens Healthcare Diagnostics; P&S Nano; Tenovus and many more.